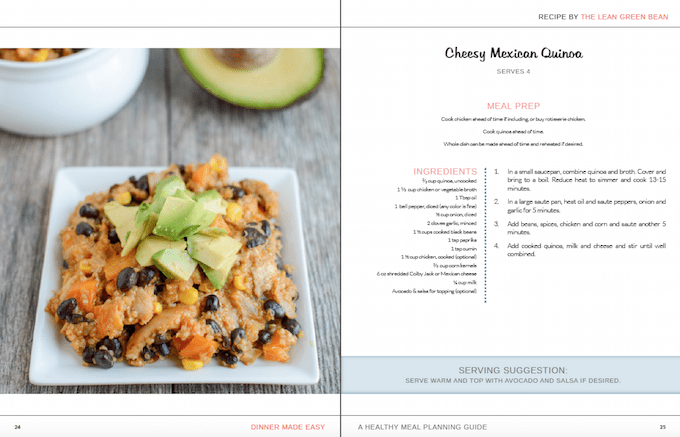 The Dinner Made Easy Ebook gives you one month of healthy meals, grocery shopping lists, meal prep tips and more, all in one place to make your life easier! I’m so excited to announce the launch of my most recent ebook. 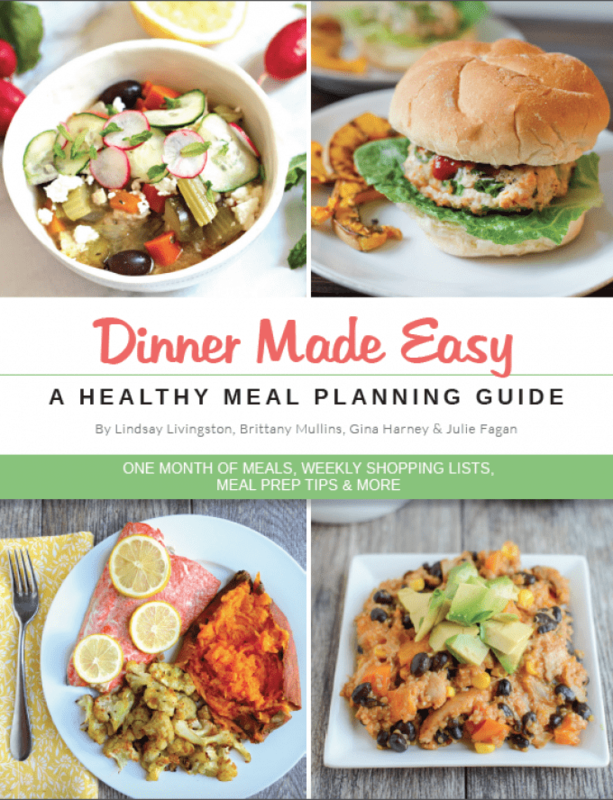 As I’ve mentioned a few times over the past couple of weeks, I teamed up with a few of my blogger friends – Julie at Peanut Butter Fingers, Brittany at Eating Bird Food and Gina at The Fitnessista – to create this Dinner Made Easy Ebook for all of you! We’re so excited that it’s finally ready to share! Are you struggling to balance your family’s hectic schedules with finding time to cook and eat healthy meals together during the week? We know the feeling! We have jobs and families and we know how hard it can be to get a healthy meal on the table when life gets crazy. That’s why we’re such huge fans of meal planning! 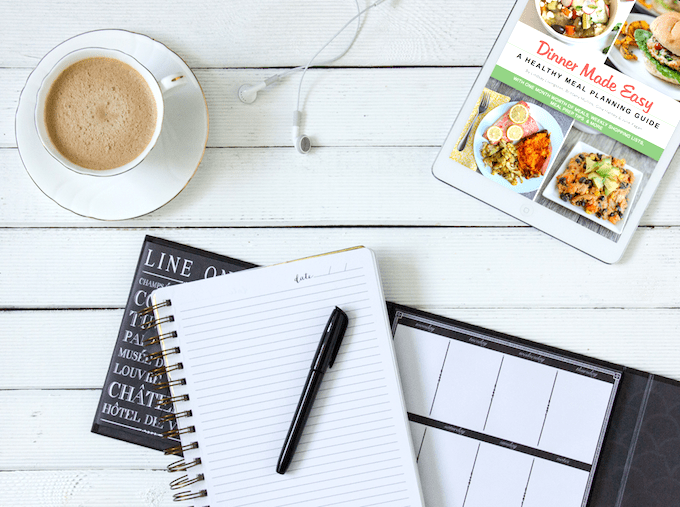 If you’re feeling overwhelmed, just remember that simply taking the time to write down what meals you want to make for the week is a great first step! It can save you time and stress during the week and for many people, meal planning and food prep are a huge part of eating healthy during the week. That’s where we come in! Our goal is to make healthy eating as easy as possible for you, so we created a 4-week meal plan filled with 20 healthy dinner options. 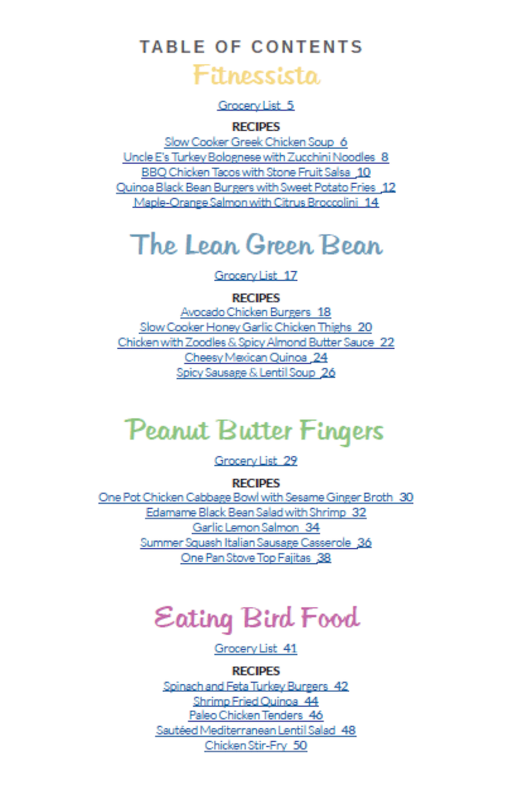 The recipes are a mix of favorite blog recipes, old blog recipes that have been revamped and a few new recipes as well! Plus, we made you a grocery list for each week of meals, and gave you a few bonus food prep tips to help you see what you could do ahead of time to make busy nights even easier! It’s kind of like hiring the four of us to come prep and plan your food for the week! Whether you’re hitting the drive-thru line a few too many times per week, ordering take-out often or spending too many nights eating cold cereal for dinner, this ebook is for you! Sound like something you need? Just click the button below to purchase your copy for our introductory price of $9.99. But don’t delay! This sale price is only good through Sunday, October 9, 2016. After that the price increases to $12.99! ok i just bought it. i’ve been saying i need to meal plan forever, but don’t ever want to think about WHAT to make – you guys did it for me. i’m trying it out! Congratulations!! 🙂 I am so happy that you guys put this together. And the fact that the recipes include what to pre ahead?! Brilliant! I am jumping with Joy,!! Your recipes have saved me time and time again and when I get some extra $$$ I’ll be buying this book FOR SURE! Stupid hair appointment lol, save up my coffee money instead! Congrats on the e-book. Looks great and such a fun idea to team up with 3 other bloggers to make a month’s worth of meal plans! I love meal planning! Is the ebool covering one month only? Will there be a new menu plan each month? Congrats on the Ebook launch! I love that you teamed up with a few other bloggers I love to make this!